Sky Movies 007 HD channel to show full James Bond catalogue from today | What Hi-Fi? Sky Movies HD has today confirmed the launch of Sky Movies 007 HD channel dedicated to the full back catalogue of James Bond films. The full back catalogue of films will be shown uninterrupted for the first time throughout October, with the channel launching on October 5th. Sky Movies 007 HD launches to coincide with the 50th anniversary of the franchise, with the first film, DR NO, released on October 5th 1962. All twenty-two Bond films, plus two non-EON Productions titles, the 1967 Casino Royale and Never Say Never Again. James Bond on Sky won't be interrupted by adverts either, thanks to Sky's insistence on keeping its films ad-free. You'll also be able to watch the channel on Sky Anytime+ and on-demand on Sky Go, including on mobile devices. In addition, customers who subscribe to Sky Movies via NOW TV, the brand new internet TV service from Sky, will also be able to enjoy entire the Bond catalogue. You can read our original story on Sky 007 HD channel below. 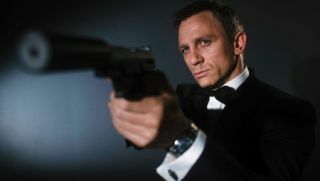 Sky has sealed a deal to show the entire James Bond film catalogue from MGM will be available to watch on Sky Movies HD from October 2012. Twenty-two official Bond films from Dr No to Quantum of Solace will be shown on Sky Movies Showcase HD, while the new Bond film Skyfall, due out in cinemas in October, will will come to Sky in spring 2013. The twenty-two films from EON Productions will also be joined by the two non-EON titles, the 1967 version of Casino Royale and Never Say Never Again, which will also be available to watch. All the films will be shown on Sky Movies Showcase HD, marking the first time the complete catalogue of James Bond films will have been shown uninterrupted and in HD in the UK. The films will also be available to watch on-demand and on the go, says Sky. Ian Lewis, Director of Sky Movies, said: “We are simply delighted to have secured the Bond films for our customers. Everything about these films is iconic – whether it’s the cars, the gadgets or the catchphrases. Sky Movies review programme 35MM will also be showing behind-the-scenes footage and exclusive interviews of Skyfall alongside the James Bond collection. For more information visit the Sky Movies website.